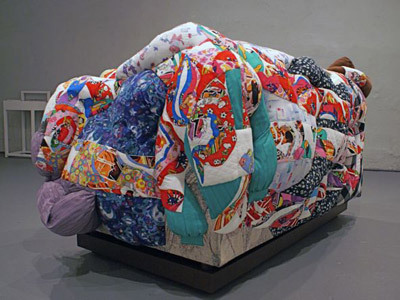 Permanent Occupant, 2007, couch, clothes and fabric;80 x 53 x 38 in. 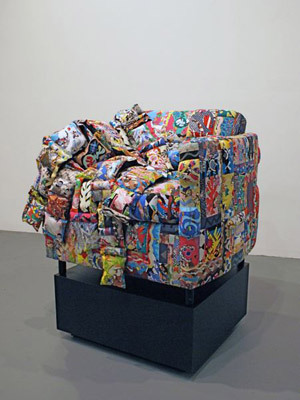 Permanent Occupant, 2007, couch, clothes and fabric; 80 x 53 x 38 in. Drawing for Thrice Filter No. 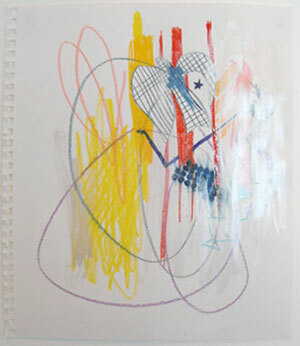 2, 2008, colored pencil and gauche on paper; 10 X 8.5 in. Drawing for Thrice Filter No. 4 , 2008, colored pencil and gauche on paper; 10 X 8.5 in. 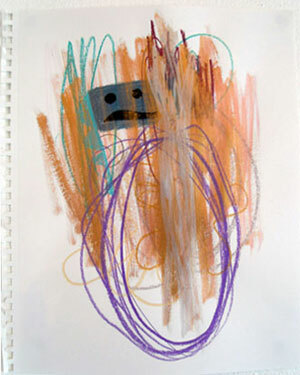 Drawing, 2004, colored pencil on paper; 15 X 21 in. 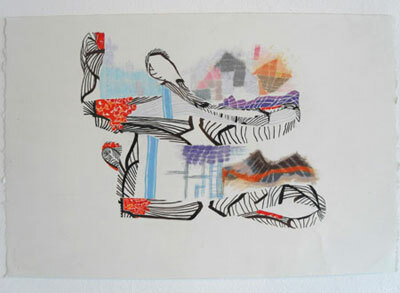 Sea and Space is pleased to present the new work of Aiko Hachisuka. 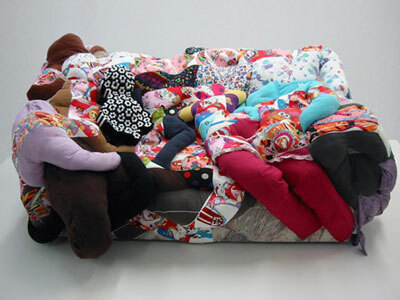 The exhibition includes two sculptures built from couches, incorporating found objects such as clothing and various styles of fabric. 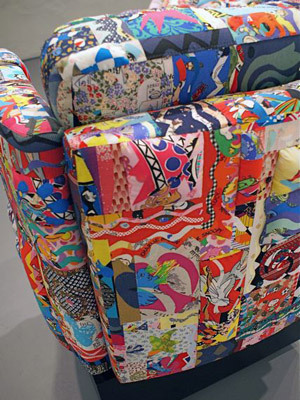 Hachisuka uses drawings, found shapes and patterns as a point of reference to create distinct forms that are unexpected and unique. 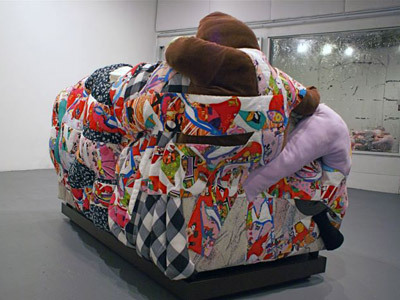 In Untitled , 2007, clothes from one family's garage sale cover the couch, stuffed and sewn on in ways that imply interlocking human bodies. 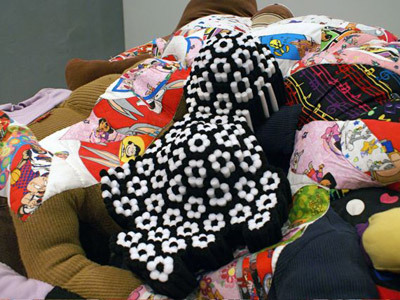 Interacting with this tangle of bodies, Hachisuka translates her drawings into sculptural form using the patterns and colors of fabric featuring children's cartoons.The sculpture is adorned with an object made from rolled black and white felt. Hachisuka graduated from California Institute of the Arts with a master's degree in 1999. 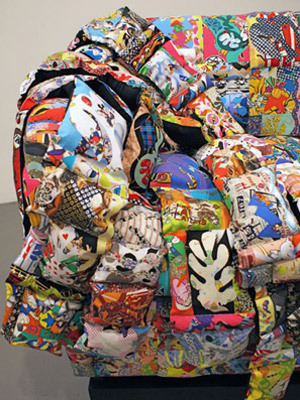 Her work has been shown at Rosamund Felsen Gallery, Santa Monica, CA, New Wight Gallery, UCLA, Los Angeles, CA, UCLA Armand Hammer Museum, Los Angeles, CA, Museum of Contemporary Art, North Miami, FL, Cohan Leslie and Browne, New York, NY, Dunn and Brown Contemporary, Dallas, TX, Museum of Fine Arts , Houston, TX and has appeared in such publications as Artweek, LA Weekly, Flash Art, Frieze and Christian Science Monitor. Hachisuka lives and works in Los Angeles, CA. Gallery is open Sundays 1-5 PM and by appointment. DIRECTIONS from Los Angeles: From the 5, take the 2 north. Take the Verdugo Road exit. Left onto Eagle Rock Boulevard. Right onto York Boulevard (major cross street is Armadale Blvd).